'Spice of Life' Family Getaway - bien approvisionné et confortable! Propre, calme et ensoleillé, confortable lotissement fin unité dans la belle ville de Crested Butte, Colorado. Magnifique vue, champs de fleurs sauvages, sommets enneigés, grand emplacement central. Toutes les commodités de la maison, avec des montagnes qui font signe de la porte d'entrée! Deux pack 'n pièces de théâtre, siège d'appoint, tasses enfant, jeux, jouets, et autres extras kid-friendly. Revenez encore et encore, à tout moment de l'année! L'été est incroyable et les fleurs sauvages sont inoubliables. Automne peuplier faux-tremble sont magnifiques. Activités hivernales sont nombreuses. VTT de classe mondiale, le ski, l'embarquement, randonnée, pêche à la mouche, festivals, la photographie et la relaxation. Venez ski Crested Butte! Pas de lignes de levage, le terrain incroyable et formidable après-ski! Venez passer un week-end, une semaine, ou un mois dans cette magnifique maison, de la famille. • 1 ci-jointe garage détaché pour stocker votre voiture et la vitesse, plus place extérieure supplémentaire dédiée pour la 2ème voiture si nécessaire. • Cuisine entièrement équipée, y compris les épices, les condiments individuels, thé, café, chocolat chaud, du pop-corn, le sucre, le miel, cuisine complète, gogo commodités. • Animaux non admis, désolé - mais grande maison pour personnes souffrant d'allergies! Base très abordable taux-nous tenterons d'égaler ou de battre le taux écrite du concurrent maison semblable! 13. Une taxe de vente de 9% exigée par la ville et des frais de nettoyage supplémentaires de 135 $ s'appliqueront. Very comfortable home and all as advertised! The property is spacious with 2 bedrooms and 2.5 baths. Includes covered parking for 1 car. We used the Mountain Shuttle service which stops right at the townhome. Very cozy and clean. All the amenities were included. The owner was very responsive to questions. Would stay here again. The only cautionary comment is there are quite a few stairs to negotiate from the garage to the front door of the townhome. Not suitable for people unaccustomed to high altitude stair negotiating especially in the winter (especially for unpacking and packing). Todd S.Where do you live? We had looked at Resort rooms for our family to stay for a ski weekend. We would have had to rent two rooms for our group at a ridiculous price. This condo fit all 7 of us for much less the price of two condos which would not have a kitchen and all the amenities and bed rooms. This unit was extremily well equipped with anything you would need. In the kitchen we found plenty of plates, pans, silverware, glasses and the list goes on. As well a large selection of spices, baggies, paper products,foil and just about any item needed to cook and serve a group. Ample towels and blankets were available as well as a full sized washer and dryer. It was very easy to step out the door and hop on the shuttle for drive free access to the resort or down to town. The owners instuctions on the units site are specific and should be fully read with important information about the unit. Crested Butte parking is limited and there is no overflow parking for the unit on streets. Resort parking nearby is available with a fee. It has two parking spaces, one a garage and one directly in front of the garage. Larger vehicles like full size pick up trucks do not fit into the garage. We can hardly wait to come back in the summer! The owner is extremely easy to work with. This place was great and had everything we possibly could have needed. We really felt at home. We are so happy to know you felt at home. We feel that enjoying a vacation feels all that more comfortable when you have everything you need. Thank you for visiting and please call on us again in the future. Everything we needed for a perfect week! The condo was clean and well equipped. We had everything we needed to cook at the house, enjoy an evening of hanging out and of course sleeping. 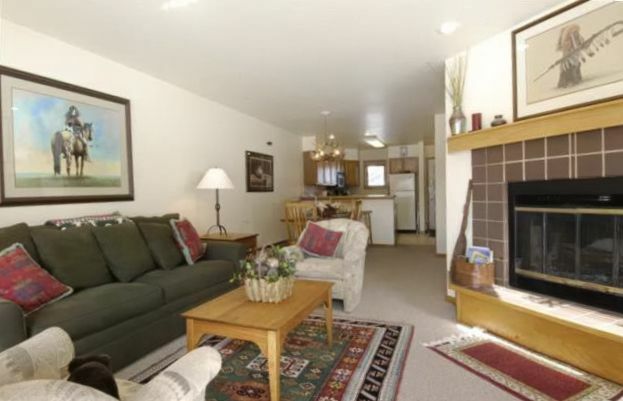 The location is perfect for those wanting to do things in town and on the mountain. We would definitely recommend this condo to others! Thank you for taking to time to write a review. We sincerely appreciate it. We are glad to hear we had the extra amenities were a big bonus. I find that when I travel, the little extras, make my life that much more easier. We would love to have you back again! Give us a shout next time you are thinking of visiting. Elizabeth's home deserves 10 stars. Her attention to detail is impeccable... her ultimate goal is clear: families are there to enjoy time together. Every essential item is covered- fully stocked kitchen, washer/dryer and cleaning supplies, thermostats in each room for added comfort, extra bedding, 2 1/2 bathrooms fully stocked, outdoor grill and so much more. The parking garage is ideal for small to medium car/SUV but I had no problems parking my Tundra outside the garage. There are a set of steep stairs leading to the home but wasn't a problem for us. The home is absolutely gorgeous with fantastic views of CB. It is a short drive to town and short walk to ski resort (and there is a free bus shuttle to town/resort). It was also a pleasure talking to John, the complex manager...very knowledgeable about CB and area. The clincher: snow covered hills outside our door step...our kids spent countless hours sledding right outside the home. Rent this home with confidence. Get ready to create some of the best memories your family will ever have. This review made me smile from ear to ear. Thank you so very much. We are thrilled that our place felt like home, and your family had such a wonderful time as well as had everything you needed. Time is precious and feeling settled and relaxed in such a beautiful place is just icing on the cake. Also, thanks for recognizing our HOA manager, John! We think the world of him as well! We would definitely love to have you all back so please let us know when you are heading that way. Summers are equally as amazing. Thanks again for the very kind and descriptive review. $130 cleaning fee will be charges as well as a required 13.5% state and local tax.